Well, November is gone and I have no idea where it went. 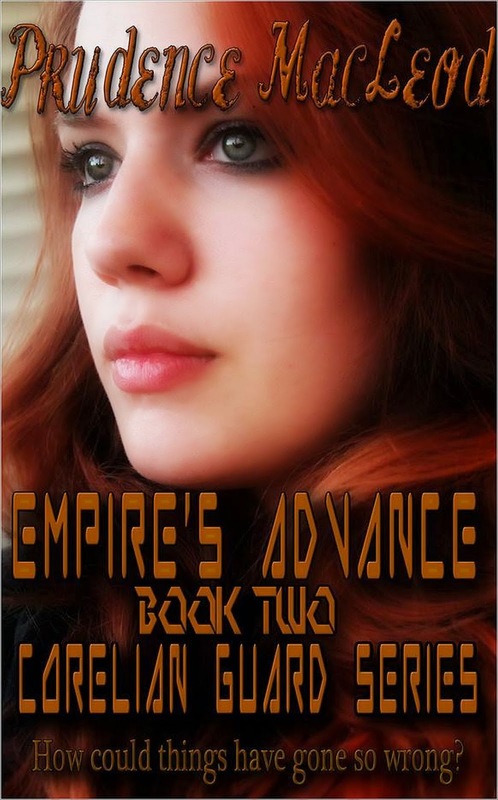 As some of you will notice, we’re a bit behind schedule in the release of Empire’s Advance. It’s looking good for this coming week so, I’ll just give you another look at the cover and a bit of what you can expect to find inside. Bear with me; we will get it out this week. Allari sat quietly watching the slow moving water as it worked its way along the valley floor. She didn’t know whether to jump back in and finish what the rapids had started, or to try finding shelter from the approaching storm. The throbbing pain in her head was matched by the ache in her heart and the rumble in her stomach. Frozen by indecision and the horror she had witnessed, Allari sat and waited for some other power to decide her fate, for she could not. She sighed then raised her eyes towards the sky as though to pray or curse the gods and the cruel fate that brought her to this desolate place. Again the vision of Jared, as the jaws of the beast closed around him and dragged him below the surface of the raging waters, filled her mind. She’d been trying to save him, but wasn’t able to get to him. She relived the terror of going over the falls and the rapids below. Allari had no idea how she had managed to survive. She had awakened, wet and cold, on that river bank a few hours ago with no idea how she had gotten there. Allari returned her gaze to the river and wept bitter tears as the rain began to fall. Okay, that’s how it all gets started. You’ll have to buy the book to find out what happens next. Tee hee hee. Now on to the ROW80 check in. This week went sideways so fast I gave up and just let it go. I didn’t manage to get Empire’s Advance out and I managed to write precious little on the WIP. Sigh. As they say, life is what happens while you make other plans. Anyway, this is a new week and a new month. Target for the upcoming week: 10,000 words. Considering the time of year this is about the best I think I can manage. Great cover and you are very close to launching another book. The excerpt has the reader bonding right away with Allari, and I wish you every success. Now did the week go sideways? Not entirely. You did get those 4,000 words done. As we enter the last month of Round 4, even if it is the end of the year, I hope all 10,000 of those words come home to you, happily advancing the plots of your WIPs. Hi Beth, thanks so much for the kind words and encouragement. It means a lot when I'm disappointed in my performance.